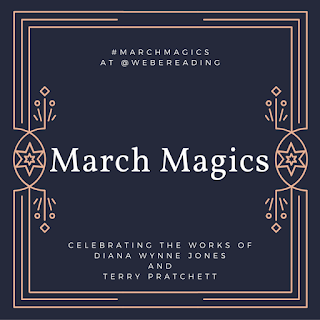 Today's prompt is to share our Diana Wynne Jones and/or Terry Pratchett collections and what we plan on reading this month. This is my Diana Wynne Jones shelf. I'll definitely be reading Dark Lord of Derkholm for the readalong and I will probably follow that with Year of the Griffin because I always want more of the griffins after the first book! There are also a few people reading Fire and Hemlock this year so I'm sure I'll decide to read that as well. This is my tiny Terry Pratchett collection. It's so tiny because, until now, I've gotten all of my Discworld books from the library. But, as I read more of them, I'm deciding that I will eventually need to own them all. I started by buying Equal Rites for the readalong! Sourcery, The Amazing Maurice and his Educated Rodents, Guards! Guards!, and Only You Can Save Mankind by Terry Pratchett. The first three are all Discworld books from different story arcs. Only You Can Save Mankind is the first in the Johnny Maxwell trilogy. Drowned Ammet, Witch's Business, and Yes, Dear by Diana Wynne Jones. I've read Witch's Business before but was in the mood to reread it this year and it's one of the few I don't own. Drowned Ammet will be my second book of the Dalemark Quartet (which I am reading very slowly as they are almost my last new-to-me DWJs) and Yes, Dear is a little picture book that I have never picked up before. 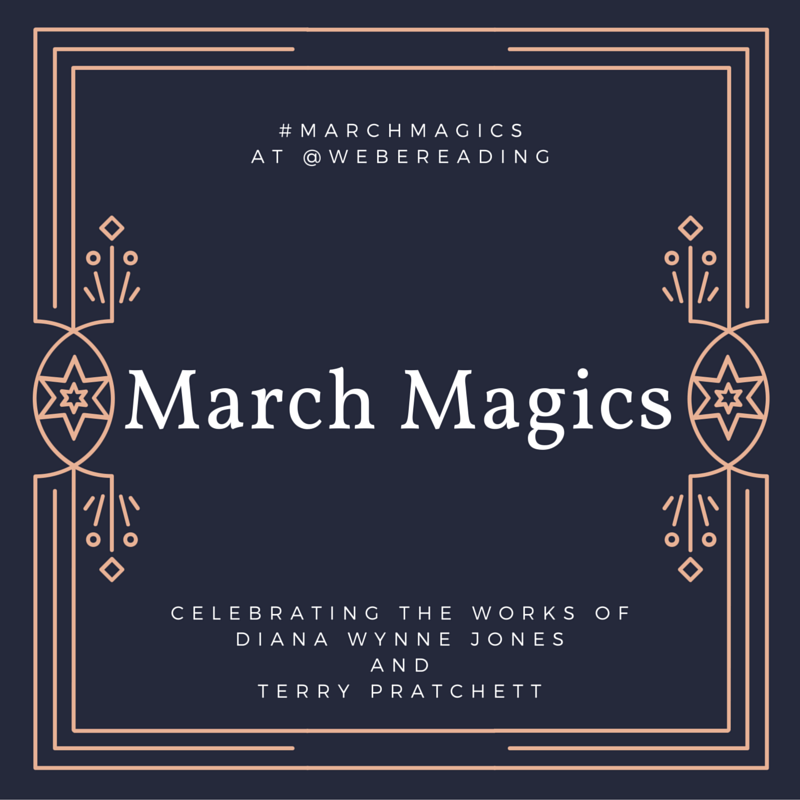 What are you planning on reading for March Magics? Nice looking stacks! 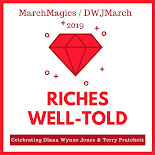 I'm thinking of reading some of the DWJ books I haven't reread so often/recently: Witch's Business, Conrad's Fate, and The Merlin Conspiracy. And for Terry Pratchett, some of the Witches books: Equal Rites, Wyrd Sisters, and Lords and Ladies (all new to me). Looking forward to a great month! I'm having fun with Witch's Business again! And I'll be very sad when there are no more new to me Discworld books but luckily that's quite a way off. :) So happy to have you joining again this year! Woot! I forget to suggest ILL to people because I'm part of a library system so we just request from any of the many regional libraries. And Mort is awesome. Thank you for joining me this year! I'm going to read The Bromeliad Trilogy by Terry Pratchett (also counts for Read My Own Damn Books). And Good Omens is HILARIOUS. There's also an audiobook version which is wonderful, narrated by Martin Jarvis. I don't know much about The Bromeliad Trilogy so I'll be watching for your reviews. I love going off of the main Discworld path. :) And I just found out in my Neil Gaiman reading that Good Omens was actually his (Neil's) first novel. I'm not sure I realized that but how wonderful to have that experience be shared with Terry Pratchett! Enjoy your reading this month! It has definitely taken time and the luck of a surprising number of DWJs at my local used book stores! The Dalemark books and Hexwood are the only DWJs I have left to read, I think. I devoured all of the books for years once I discovered her and then I put the brakes on when I figured out that I was almost out of new books. Maybe you would like Dodger? I have a post about it tomorrow and it's a lot different than the Discworld books. I get Pratchett second hand so I almost own all of his books. Eventually I will buy new the few that I haven't been able to find. And then I will own all of this books!! A good portion of my DWJs are secondhand so I should be able to do the same with Pratchetts now that I've decided to collect them. The problem is that even at $5 a piece, 40 books is a lot of money!